Ruckus the Eskie: I'm Jumping Through Hoops for Ya! What's a pup gotta do to get your attention??? This is a sneak peak of a Dog Park we recently visited. It has a very impressive agility course including this free-hanging hoop. Review will be posted soon! 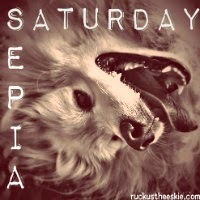 In the meantime, look forward to Sepia Saturday, starting this weekend! Well done Ruckus! Love the new hoop, that will allow some great new exercise for you. Thanks for joining the Hop - see you tomorrow. Look at you jumping through that hoop, Ruckus! Well done. Sepia Saturday, eh? Sounds like something I could do. We love sepia-toned photos. love the idea but don't think I have the time to pawticipate. Will do it another time though! You have really been doing some hoop jumpin' lately! We're all ready for Sepia Saturday and the post will go up at 12:01 am EST. I'll have to wait until my lazy Human gets around to it to link up! I just know it will be a really popular hop!!! Can't wait! Love you jumping through the hoop!